The red maple brought with it decades of history, and, in its final years, a sense of familiarity for editor Peggy Grodinsky. A red maple tree. It was a sizable tree, though not immense. 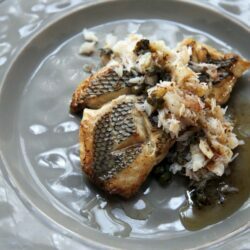 It stood next to a small, shingled brown bungalow on a one-block, dead-end street in Portland, Maine. The tree sheltered the little house, and the woman who lived there, too. In spring, she remarked on its beautiful crimson buds. In summer, she enjoyed its leafy green shade, which kept her house cool and comfortable. 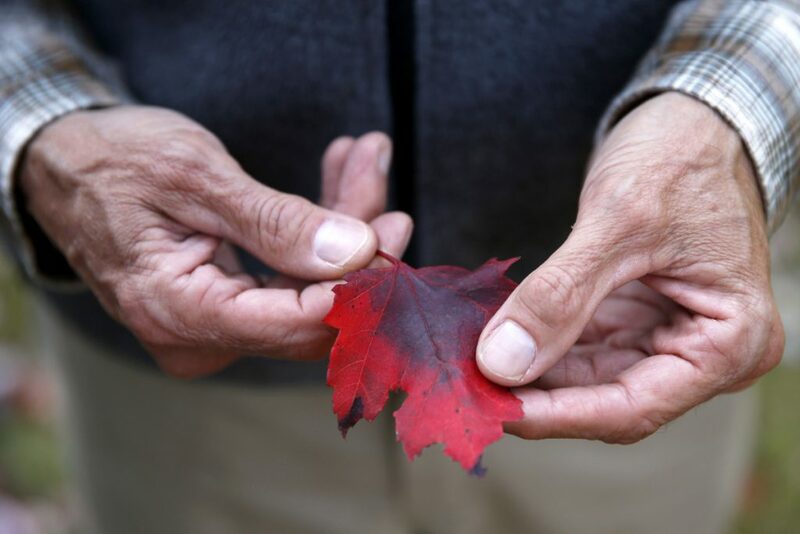 Every fall, the woman spent many hours raking, but she never minded, even when she got blisters on her fingers, because the red maple had the most beautiful red leaves imaginable. 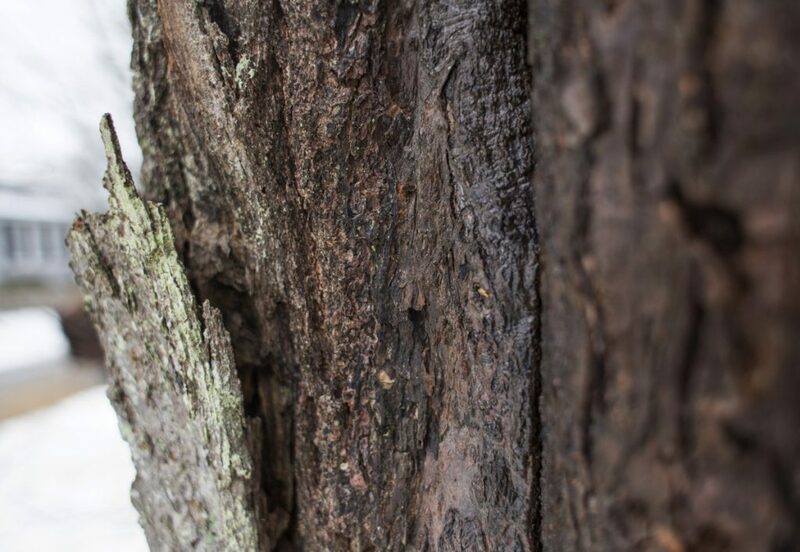 In winter, its handsome, battered trunk – bark peeling and specked in lichen – greeted her like an old friend as she stepped off the front porch each morning to go to work. “Good morning,” she’d nod at the tree, and it seemed to her the wise old tree wished her good morning, too. If you live in Portland and must remove a tree that is in the public view and along a city street right of way, the city’s Co-op Tree Planting Program will help you replace it. You pick and pay for a tree from a recommended list at one of several local nurseries. Come June, the city’s forestry crew will fetch the tree for you and plant it in your yard. “Keep in mind the desired tree characteristics along with the site conditions,” the program advises. Find details at portlandmaine.gov. The program dates back to the 1970s, City Arborist Jeff Tarling says, when Portland lost some 20,000 (!) 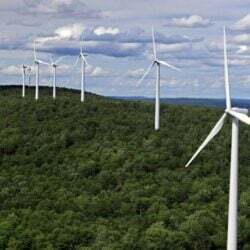 elm trees to Dutch Elm Disease. 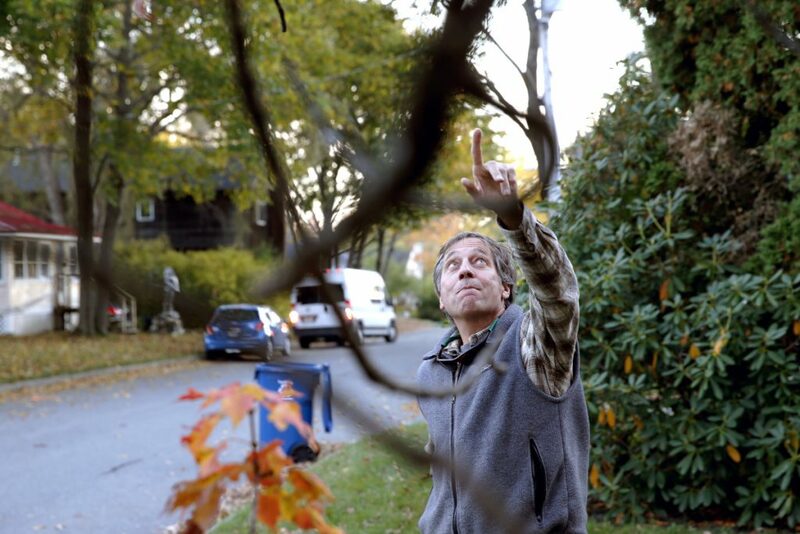 Though the city couldn’t afford to replace so many trees, it could encourage residents to re-plant the trees themselves by helping with the selection, transfer and digging. That woman is me. And this fall, I faced a decision that tore me apart. 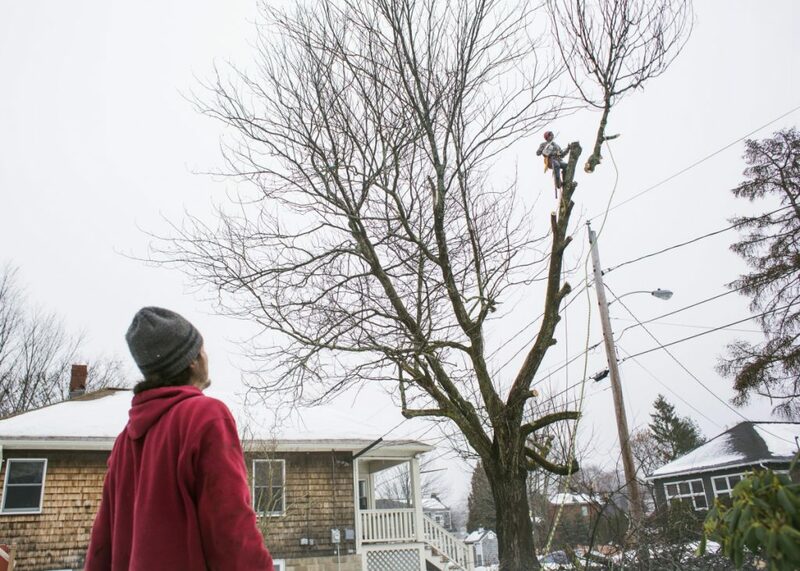 Did the red maple tree need to come down? It was a “little teeny tree,” he said. But it must have liked its new home, because over the years it grew big and strong. By the time the red maple and I got acquainted just a few years ago, its trunk was the girth of an imposing column, and the tree itself towered over me and the single-story house it was planted to shade. A sizable branch bent toward the house, seeming to snuggle. (That’s not how the house inspector saw it. He warned me about a squirrel highway.) Several more fair-sized branches reached up to make a three-dimensional V shape of sorts that supported the crown. 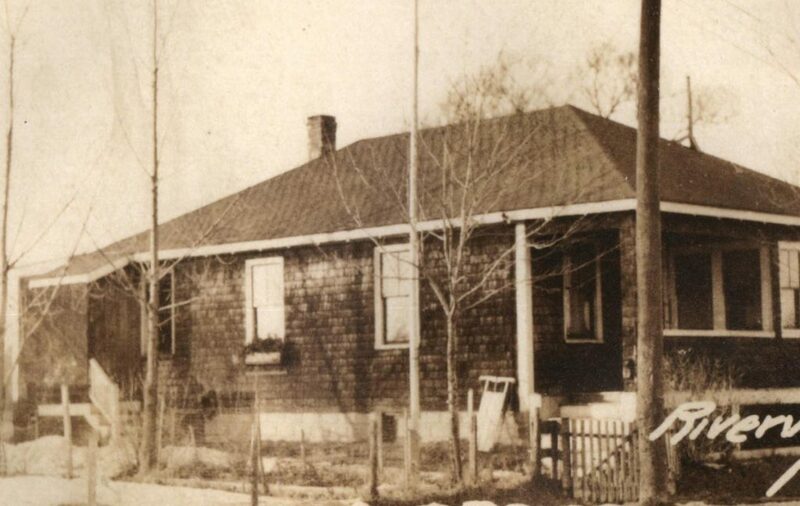 The maple’s position near the house – too near, Tarling said – made it feel private and secure. Squirrels chased and chattered up the tree and back down again. Birds perched on its accommodating branches. The cat in residence, Trixie by name, made occasional and frenetic runs up the trunk, while the neighbor’s little boy was partial to the peeling bark. Though the roots defied me at every turn when I tried to carve out garden beds, it felt like a friendly game we played. The center of the tree, it’s true, had a gap, a gash really, where it looked as though a scaffold branch should be – had been. And the maple dropped small – and sometimes not-quite-so-small – branches on the lawn more often than perhaps was strictly usual. But it leafed out beautifully each spring, and I doubt I’d have given its health a second thought until I heard different from a parade of experts. First came Press Herald Maine Gardener columnist Tom Atwell, who strolled around the yard a few years ago to help me envision a garden. 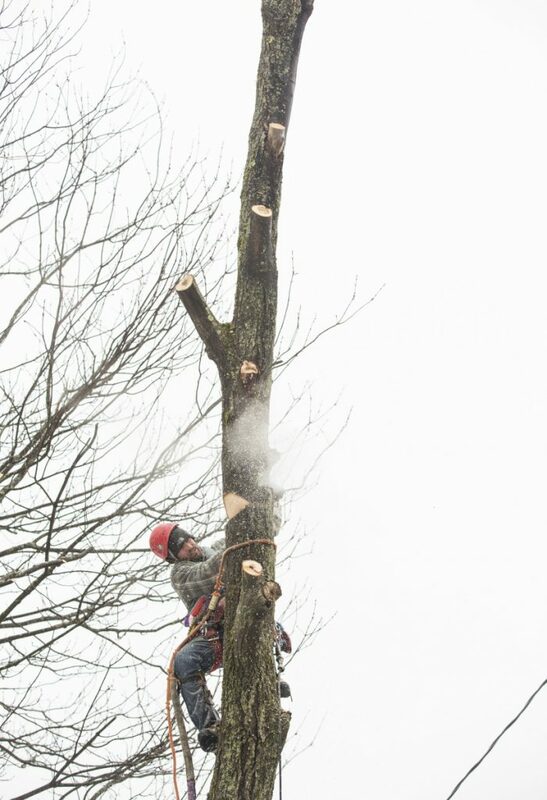 He took one hard, practiced look at the red maple, described it as dying, and told me I’d need to take it down. Winter approached. My third winter in my home. During wind and ice storms I found myself avoiding the corner of the house where I feared the tree could hit if it fell. One early fall day I made an appointment, and a week or so later, Kevin Bachelor of For-Tay Landscaping in South Portland came round to take the tree’s measure. He, too, thought its days were numbered. How long do I have? I asked. “Three storms. Maybe two,” Bachelor said. Tarling didn’t make the decision any easier when he stopped by in October and told me the tree had good “root flair,” that it had survived the summer’s drought surprisingly well and that its condition wasn’t “catastrophic.” But he wasn’t exactly sanguine, either, guessing my red maple had been damaged in a storm – he ticked off the ice storm of 1997, the Patriot’s Day storm, and hurricanes Bob and Gloria as possibilities. 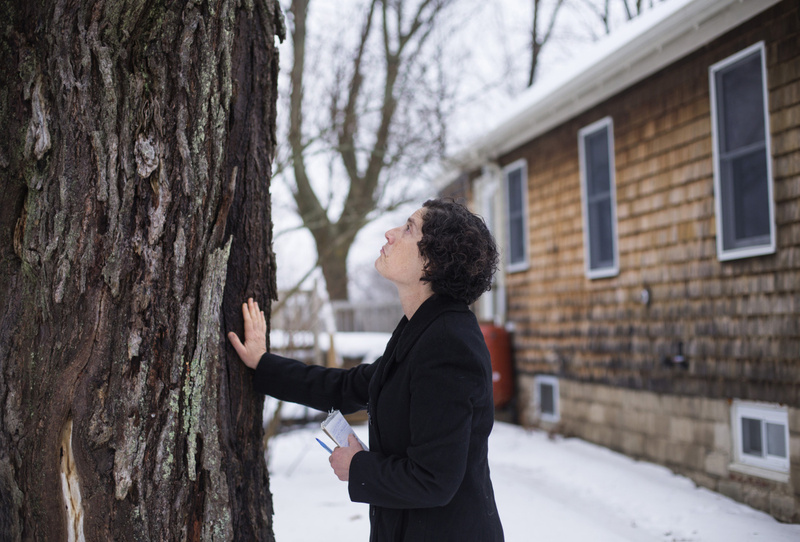 Press Herald Source editor Peggy Grodinsky puts a hand on a red maple tree in her yard before it was cut down on Jan. 12. The top blew out, Tarling said, and decay gradually set in. My nearest neighbors, longtime residents, didn’t remember the event. 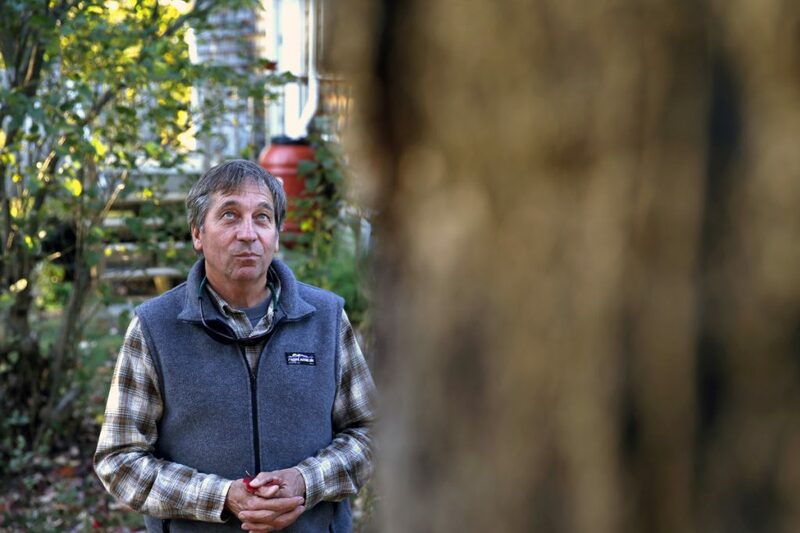 Tarling, who has been city arborist for going on 28 years and knows Portland’s trees with the intimacy of an old friend, thought he did. In the case of my red maple, the answer was, in part, the power lines. I’m a newcomer to the neighborhood. 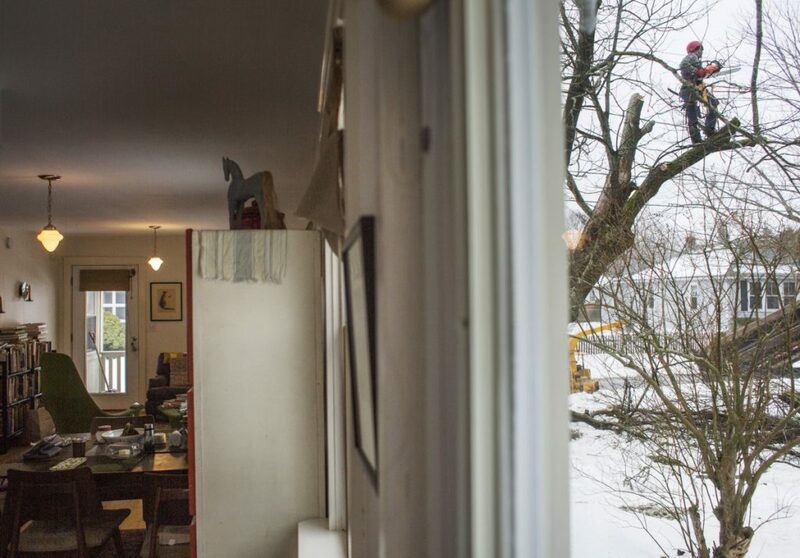 I have lived in my house not yet three years, while the red maple has called the place home for a century. Neighbors aside, what gave me the right to kill it? When my sisters and I were small, we gave my mother, an accomplished gardener, an apple tree one Mother’s Day. It thrived for some five years until one day she decided it didn’t suit the lines of her garden. And just like that it was gone. 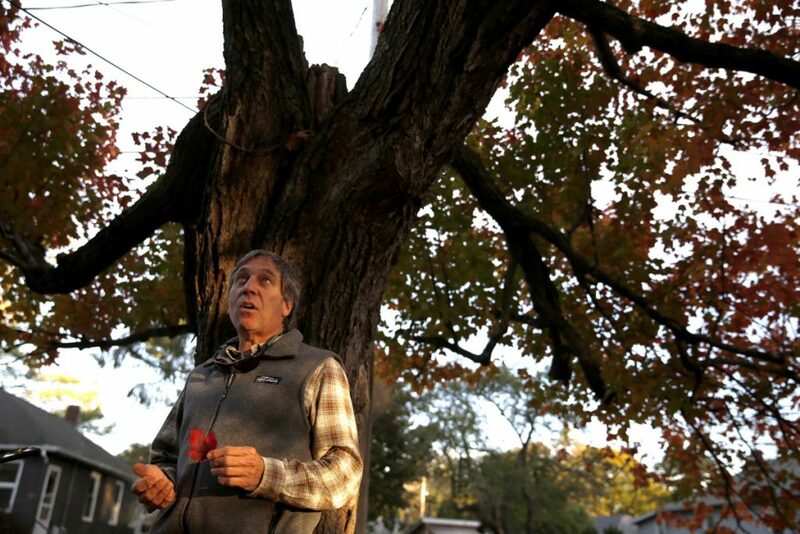 Like my mother, Press Herald garden columnist Atwell had no romantic notions about my tree. “The tree is a living thing, but there is no problem with taking it down,” he said when I called him, indecisive and distressed. Just plant another maple in its place, he suggested. An incredulous silence blared from the other end of the phone. A number of maples grow on my own street, all roughly the size of my red maple. Maybe each of the families that lived in each of the then-new bungalows a century ago also longed for shade. The trees grew up together, not unlike the children on the block who grew up together over the years. Were they fretting about their ailing old friend? Would they mourn its demise? 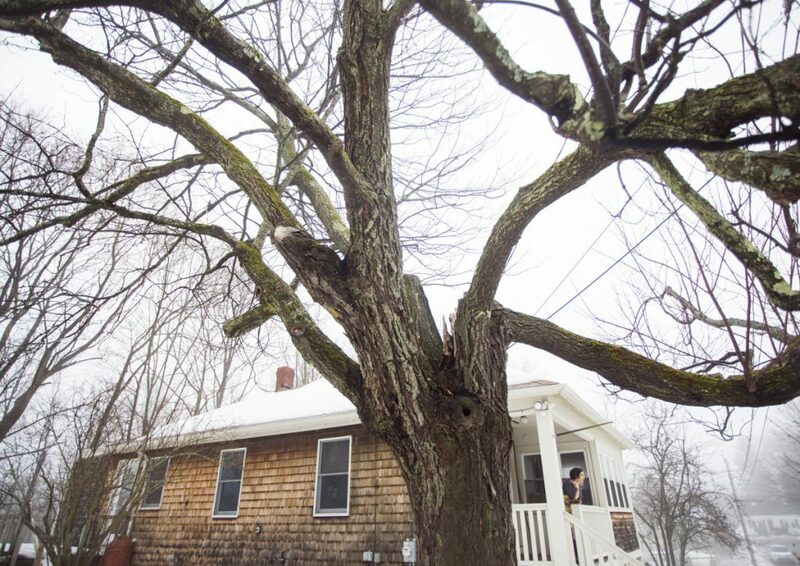 On Oct. 29, a wind and rain storm ripped through Maine, toppling hundreds of trees. Among them was a tall, thin, erect white pine that stood directly across the street, a favorite hangout for passing crows and hawks. It took its last breath – yes, trees breathe – early in the morning. 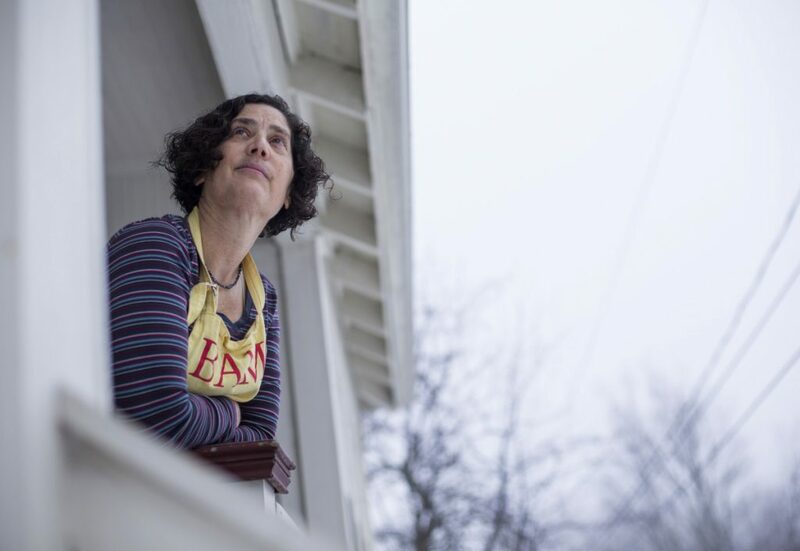 By the time I woke up, it lay on the ground, its crown stretching toward the street, its trunk precisely aligned alongside the length of my neighbor’s house, missing it – missing her – by a barely a foot. I had prayed the red maple would fall, on its own terms, in its own time – missing the house, the street and the power lines. In fact, my red maple survived without so much as a scratch – making it even more wildly unfair that that storm and the damage it wrought sealed its death warrant. 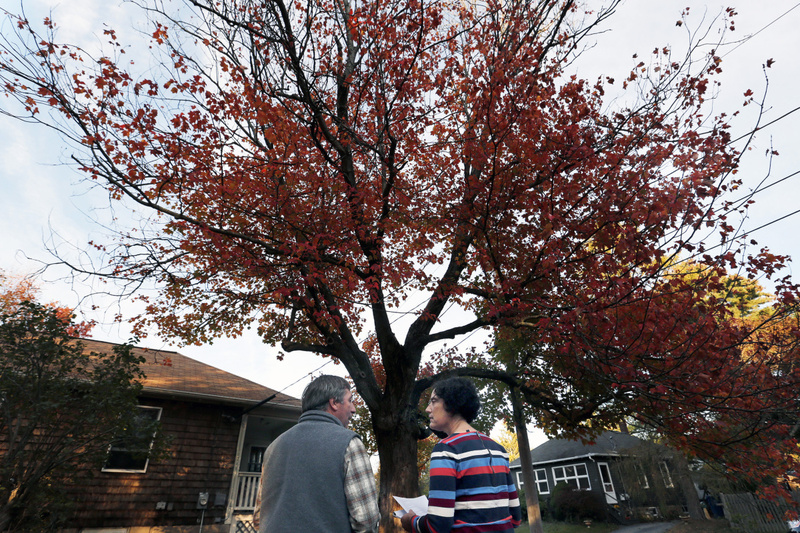 City arborist Jeff Tarling talks to Grodinsky about the health of a century-old red maple tree on her property. If you ask me, there is no good time to cut down a tree. Certainly not one that looks, at least to the inexpert eye, like it has years of life left. 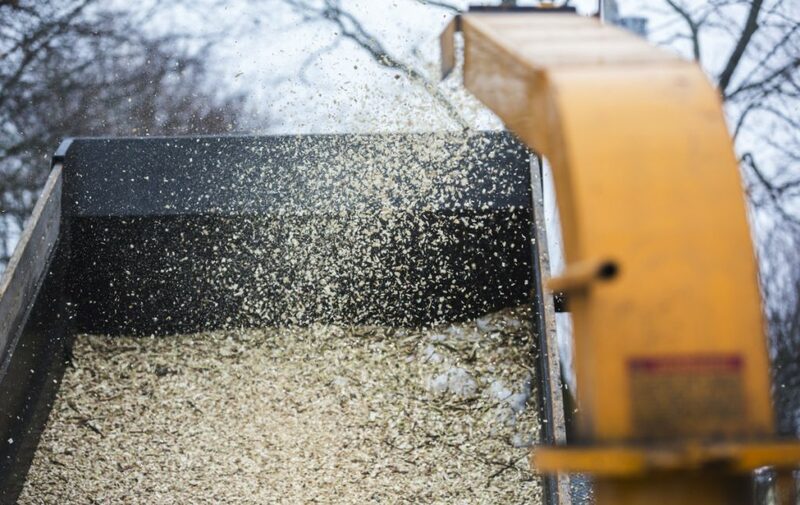 But if you ask the experts, late fall or winter is the right time. The birds have flown, so you won’t be an avian homewrecker. Unless you’re sheltering a hibernating bear – the red maple wasn’t – you are probably OK on that count, too. 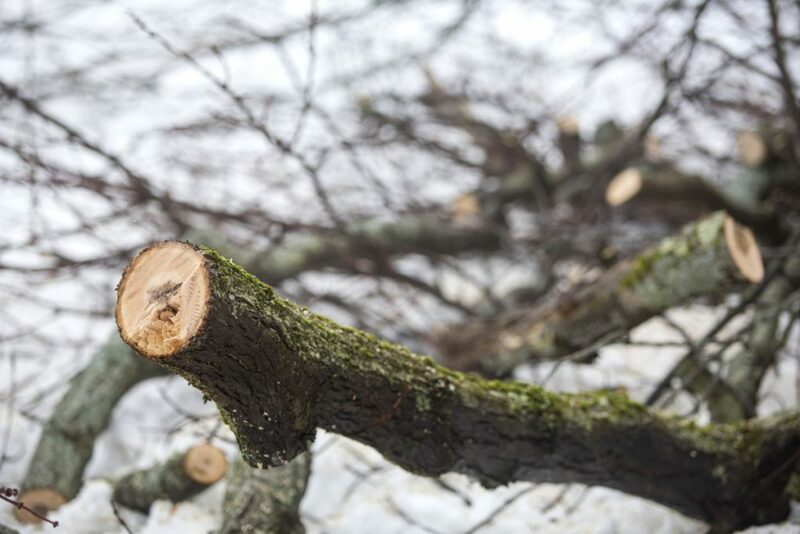 You’ve had one last season to delight in the tree’s flaming red leaves, and once they fall, their lack makes the arborist’s job easier, while the hard, frozen ground protects the yard from any heavy machinery that’s required to do the job. “I’m not sure there is ever an easy time to let things go,” a sympathetic Tarling said. With a heavy heart, I scheduled the day of execution. On Jan. 11, a cold, beautiful, star-lit evening, I came home from work, stepped into snow up to my knees, wrapped my arms around the tree’s trunk – they didn’t meet, or come close to meeting – and sobbed. Jan. 12 dawned gray and gloomy, “a good day for grief,” my friend Charmaine Daniels said. By 9 a.m., Bachelor was setting up, and Richmond woodworker Jeff Raymond, who hoped to turn the wood into a few of his beautiful, handcrafted bowls, had arrived. By 10:19 a.m., Bachelor had put his equipment in place, and he clambered up the tree in spiked boots. I retreated to the back of my house, unable to watch. The sounds of the chainsaw followed me like a scream. By 2:11 p.m., there was no red maple. It took 100 years to grow and four hours to demolish. On the Seven Stages of Grief scale, I remain somewhere between 2 (pain and guilt) and 4 (depression, reflection, loneliness). Possibly the worst moment of the day my red maple came down was when Bachelor told me he was surprised to find that no bugs had infested it. 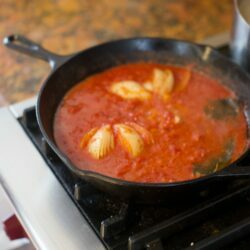 Had I made a mistake? – a question I asked him at least seven times the morning he was setting up. If he was exasperated, he kept it to himself. And if I made a mistake, it was irrevocable. It may be a quince tree, to shower the yard every spring with beautiful pink blossoms and my kitchen every fall with tempting quince tarts. Or, like the dog owner who buys the same breed time and again when his pet dies, it may be a red maple.